Nikkei-style Peruvian cuisine finally makes it to NYC, thanks to executive chef Mina Newman. You’d think the flavors of Peru would be more prevalent in a city like New York. Influenced by its diverse geography and culinary styles (brought there by Spanish, Italian, Chinese, Japanese, and West African immigrants), chefs from this South American country excel at blending abstract flavors to create inspired, healthy dishes. And yet there’s only a handful of spots that come to mind when you think of New York’s Peruvian food scene—Pio Pio, Raymi, the model-owned Baby Brasa, Llama Inn (aka home to a sharply dressed spokes-alpaca). Executive chef Mina Newman aims to change the conversation with Sen Sakana, a Nikkei-style mash-up located steps away from the Great White Way (28 West 44th Street between Fifth and Sixth Avenues). 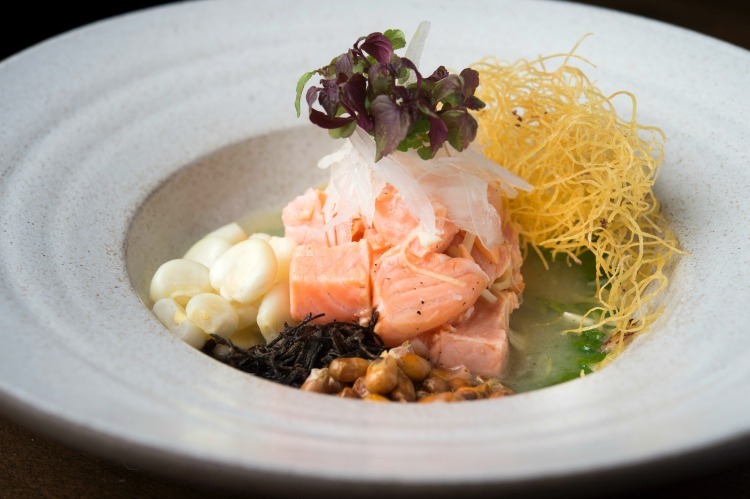 Fusing her native Peruvian cuisine with that of Japan’s (and vice versa), Newman tells the tale of a cross-cultural exchange that spans more than two centuries. (I won’t spoil the story for you; it’s written on the front of the menu.) The restaurant’s name even supplies a little amuse-bouche of what to expect, translating as “one thousand fish” in Japanese in reference to the amount of species known to swim the waters off the coast of Peru. The sprawling space—it used to be a pizzeria, barbershop, and a tailor—is as striking as it is minimalist. Clean-cut columns block out your view of the interior from the outside in, which makes the entrance into the dining room that much more exciting. Splitting up the sea of two-toppers with Japanese tablescapes (splinter-free chopsticks are presented on charcoal black stones; a small dish with a towelette expands when wet) are narrow blonde woods, hues of gray and aqua, and a lively sushi bar led by Sang Hyun Lee. Despite the alluring spread of nigiri and hand rolls offered (one selection, the Hotate with Pisco ponzu jelly and yuzu kosho paste, is the first thing I’m ordering on my next visit), I started with several of their small plates. First up, Sen Sakana’s duo of harumaki which completely unraveled my idea of run-of-the-mill spring rolls. Sitting pretty inside crispy skins are scallops marinated in yuzu in one and spicy tuna that tingles long after your first bite in the other. The yucca croquetas that came next were almost impossible not to pop into my mouth all at once (although the hot queso and hotter interior put a dent in that plan). My date and I did just that, however, with our madai tiradito, a sashimi-ceviche red snapper hybrid atop shredded harumaki and soy-soaked kelp and a fruity aji amarillo sauce that tied the complex tastes and textures together into a perfect forkful. You’d be doing yourself a great disservice if you didn’t order a few izakaya-styled plates, too. We ordered a trio of robata-grilled skewers, each more ambitious than the last; while the tsukune chicken meatball was especially juicy and the beef heart practically beat in my mouth, the washu beef flap packed a powerful punch with the inclusion of cilantro. Meanwhile, the kitchen’s Peruvian iteration of the homey oyakodon—the Japanese rice bowl translates to “parent-and-child donburi”—had the usual inclusions of chicken (marinated in soy sauce and lime juice) and egg (freshly cracked at the table) combined with a herbaceous green rice and a sprinkling of crisp Incan corn. At our table throughout the meal was an order of root vegetable chips with a side of smoky charred tomato dip, a delightful snack that brought all of the meal’s robust flavors together. And to drink? Pisco is a rarity on New York’s cocktail scene, so beverage director and sommelier Zachary Gross shakes and stirs libations that let it shine in several complex ways. A solid introduction to the South American brandy should start with Sen Sakana’s take on the Pisco Sour, doubly infused with lemongrass (in the Pisco and a shochu), brilliantly whipped with egg whites, and topped with an amber S made out of celery bitters. My date was pleasantly surprised by the Sophia Loren, a classic envisioned by the general manager, made with vermouth, Cocchi Americano, and a hint of absinthe. Probably the most surprising of the bunch was One Thousand Fish, a strong Japanese whiskey sipper infused with bonito flakes. The salty sea scent might throw you off, but the end result is sheer liquid umami. 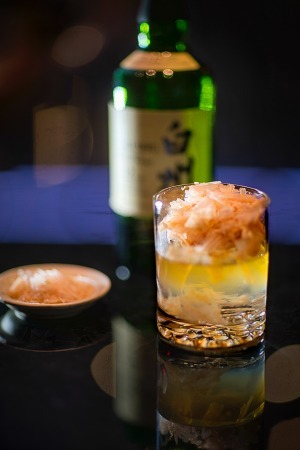 Down the block from several Broadway showstoppers, Sen Sakana is a natural place to pregame before a night at the theater, although no one would blame you if you were a few minutes late to curtain. I spent upwards of three hours enjoying my conversations and culinary education, and could’ve spent more. I’d happily make the trek through the idle crowds of Times Square for a return visit. In a city where you think you’ve tasted everything, you find unsuspecting gems like Sen Sakana that make you realize there’s still ample opportunity to take your taste buds on an unexpected trip. Prep your palate for a night of Peruvian delights.